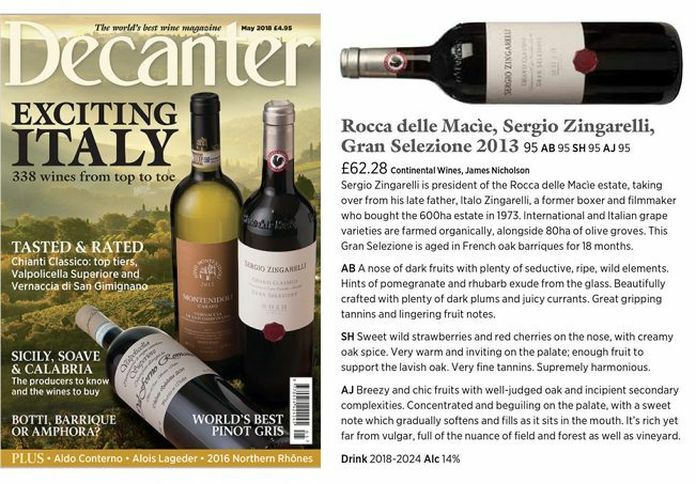 Sergio Zingarelli is president of Rocca delle Macìe estate, taking over from his late father, Italo Zingarelli, a former boxer and filmmaker who bought the 600ha estate in 1973. International and Italian grape varieties are farmed organically, alongside 80ha of olive groves. This Gran Selezione is aged in French oak barriques for 18 months. AB A nose of dark fruits with plenty of seductive, ripe, wild elements. Hints of pomegranate and rhubarb exude from the glass. Beautifully crafted with plenty of dark plums of dark plums and juicy currants. Great gripping tannins and lingering fruit notes. SH Sweet wild strawberries and red cherries on the nose, with creamy oak spice. Very warm and inviting on the palate; enough fruit to support the lavish oak. Very fine tannins. Supremely harmonious. AJ Breezy and chic fruit with well-judged oak and incipient secondary complexities. Concentrated and beguiling on the palate, with a sweet note which gradually softens and fills as it sits in the mouth. It’s rich yet far from vulgar, full of the nuance of field and forest as well as vineyard.